If you have ever watched the Olympic rowing events and have wondered what it feels like to glide over the water's surface in unison with 8 other rowers, then we have a class for you. 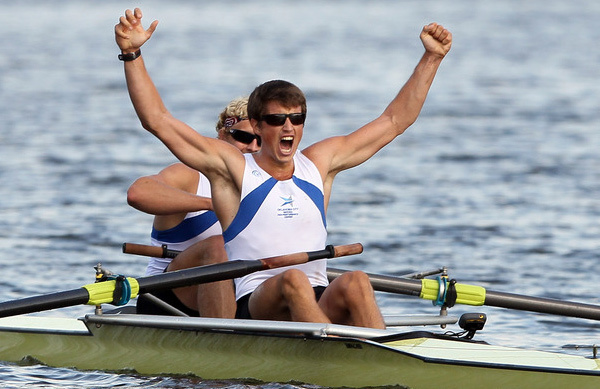 You too can experience that feeling in our rowing and sculling classes, and no prior experience is required. As a former rowing coach, I have see many new students of rowing get inspired by what they have seen in an Olympic rowing event, or on a trip to Boston, or Philly, where you are likely to see rowing shells zipping by downtown high rise buildings. Most expect to climb into a boat and start gracefully gliding over the surface of the water with the sound of classical music in their head, only to be surprised when they actually feel like a drunk octopus dancing to heavy metal music after their first lesson. It's a sport that can be mastered by people of all ages and levels of ability, however, the initial learning curve can feel a bit more like a mountain than a mole hill. So when we teach new rowers the foundation of the sport we start with small baby steps. Once we have a basic foundation of the body motions, timing, and bladework, then we actually go out in the long, sleek, and skinny rowing eight, like you see in the Olympics, and apply all these principles while trying to balance, or set, the boat. Imagine 8 people tied together on a balance beam, each with a pole on one side for balance. It can feel like a daunting proposition, and take a great amount of focus. But as a long time instructor, I have seen hundreds of people over the month-long course gradually get to the point where their mind relaxes, their bodies swing in motion, and before they know it, they are gracefully gliding over the surface of the water like an Olympian. Many of them go on and join recreational and competitive rowing clubs like Mission Bay Rowing Association (MBRA) which rows out of the MBAC. If you have ever wondered what rowing feels like, I encourage you to try our Basic Sweep Rowing class or Sculling Level 1 class. Or if you would like further information you can call us at (858) 488-1000.